4 day and a few hours till I experience that in person again. I’m not sure if the London book event includes a Q&A with the audience. I’m planning to have a few questions ready, just in case. It’s not easy to come up with something unique to ask, which hopefully prompt some interesting stories from him. I’m still stoked about the offical version of this song. Totally stoked. For more than a year, probably closer to two, I tried to pick up journaling again. To gather my thoughts. To take notes. To remember stuff. Writing usually helps me to think, if that makes any sense. For a long time I imagined and tried blogging to be a substitute for journaling, but it just didn’t work out that way. Maybe because I chose to blog in English, which is not my first language. And journaling is something you do in your first language, isn’t it? I also tried to keep my To-Do-Lists more organized or to organize my tasks/plans everything in some kind of list. Organize it at all. So I started various notebooks (journal/to-do-list) combinations and setups (like Bullet Journal) and gave up on everyone after a while. Started anew (often with a new notebook as well) after a few weeks. Nothing stuck. I’m a huge fan of the TV show, actors and all (and the books, of course). I follow a lot of cast and crew on Twitter and read fan blogs and such. But then, this weekend, I realized I’m just on the outside of the fandom looking in. And I’m rather happy and content to be, because sometimes this fandom is just nuts! Obviously I missed the photos of naked Jamie (for those who have read the books: the scene at the mill pond), when these photos first showed up online this weekend. I don’t really care how they got there. If they were leaked or not leaked or officially leaked or whatever. I briefly peeked at some comments / discussion about them on Facebook and was glad again, that I’m too out-of-the-loop to have to deal with that in my Facebook feed or even worse my Twitter timeline on a regular basis. Because appreciating Jamie’s/Sam’s body is one thing. Objectifying him is quite another. And embarrasing lewdness is such a no-go for me. Seriously. Maybe I’m just over-protetective of my “book-boyfriend-come-to-life” Sam, but still… It’s just something I can do very well without. So I’m quite glad in my tiny bubble in a corner of the Outlander fandom. At the moment my 2nd favourite team, the Iserlohn Roosters might make it to game 7 in the quarterfinals. Wooohooo! I’m so rooting for them this year. They’re playing against last year’s champions though. We’ll have to see. And keep my fingers crossed. But they are up 5:1 after 2nd period, so I’m cautiously optimistic. I watched the first two episodes of the Poldark series and kind of liked it. I like Aidan Turner and think he’s a good fit for that part. I’m not so sure about the rest of the characters yet, i.e. if I like them enough to keep watching in the long run. A long time ago someone recommended the novels to me and when I checked Wikipedia, what they were all about, I read something which made me not want to read them after all. Might be different with the TV series, at least until that thing I read about will play out. I’ve been wearing Trollbeads bracelets for a long time now. I’ve always only worn the silver bracelets, because back when I started my collection the leather bracelets didn’t feel right for me or whatever. The lock of my 2nd silver bracelet broke last year, so I could only wear the other one. 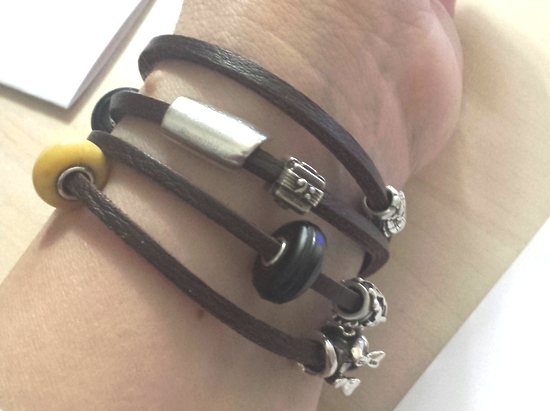 Some time ago I started thinking that maybe I should give the leather bracelets another try, because the (heavy) silver bracelet started bothering me more than it used to. So last week I checked out the leather ones again and on a whim bought two. (No self-control, really. Because one would have done it for a start, of course *g*).